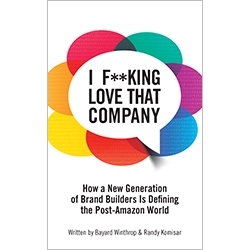 "I F**king Love That Company by Bayard Winthrop"
See option above to purchase additional copies and save more than 30 percent. Most retailers today are little more than real estate developers. The costs necessary to support vast infrastructures built on leases and global supply chains have become serious liabilities. Retail is changing and bricks and mortar retailers are having a hard time finding their niche in this social media world. Bayard Winthrop, the founder and CEO of American Giant. uses this forum to discuss how retail is changing, why the consumer now holds the power in the retail world, and how new retail brands are changing the face of the industry. Winthrop says that brands that cannot inspire love and loyalty with their customers will die, whereas customers who love their brands have a multitude of ways to share that love with the whole world. As Winthrop writes in the introduction, "This new breed of brands operates according to a fresh set of rules and expectations. Size, scale, and speed don't define success for them. Efficiency, quality, company values—and the power of an Instagram plug—do." Today, when customers feel loyal to a brand, they let the world know about it--and don't hold back. Companies that are able to inspire that kind of love and loyalty will be the ones best positioned for growth.